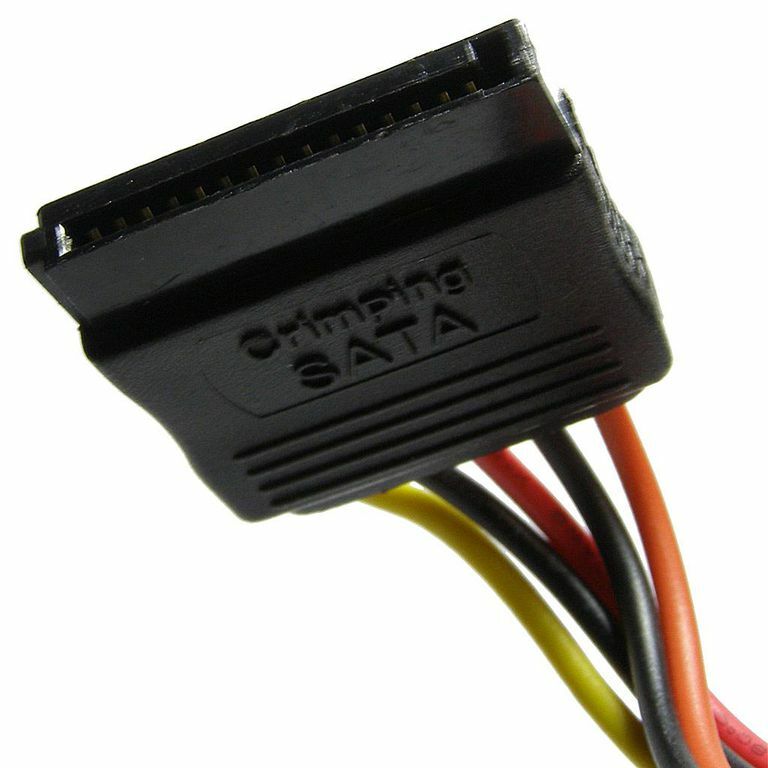 The SATA 15-pin power supply connector is one of the standard peripheral power connectors in computers. It's the standard connector for all SATA-based hard drives and optical drives. SATA power cables protrude from the power supply unit and are meant to reside only inside the computer case. This is unlike SATA data cables, which are also usually kept behind the case but can also connect to external SATA devices such as external hard drives via a SATA to eSATA bracket. A pinout is a reference that describes the pins or contacts that connect an electrical device or connector. Below is the pinout for the standard SATA 15-pin peripheral power connector as of Version 2.2 of the ATX Specification. If you're using this pinout table to test power supply voltages, be aware that the voltages must be within ATX-specified tolerances. There are two less-common SATA power connectors: a 6-pin connector called a slimline connector (supplies +5 VDC) and a 9-pin connector called a micro connector (supplies +3.3 VDC and +5 VDC). The pinout tables for those connectors differ from the one shown here. SATA power cables are required for powering internal SATA hardware such as hard drives; they do not work with older Parallel ATA (PATA) devices. Since older devices that require a PATA connection still exist, some power supplies may only have 4-pin Molex power supply connectors. If your power supply doesn't provide a SATA power cable, you can buy a Molex-to-SATA adapter to power your SATA device over a Molex power connection. The StarTech 4-pin to 15-pin power cable adapter is one example. One difference between PATA and SATA data cables is that two PATA devices can connect to the same data cable, whereas only one SATA device can attach to a single SATA data cable. However, SATA cables are much thinner and easier to manage inside a computer, which is important for cable management and room but also for proper airflow. While a SATA power cable has 15 pins, SATA data cables have just seven.